In this blog post, I’ll explain how to get lean legs by using HIIT. I’ll show you how to tailor your HIIT to make it a fat burning activity that will assist you in getting those slim and toned legs! 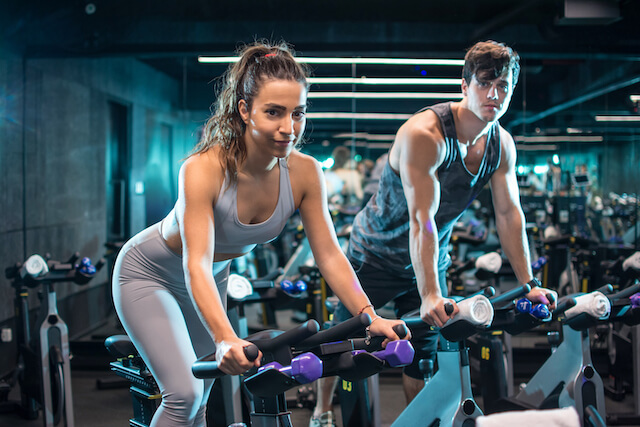 You may know from my previous blog post on cardio that low to moderate intensity cardio is a fat burning activity, whereas HIIT and weights typically are not. HIIT and weights are an anaerobic activity, which means your body uses glycogen (carbs) as the main fuel source, not fat. Cardio is an aerobic activity, which means your body uses glycogen (carbs) and fat as the main fuel source. When you do cardio your body gets into the fat burning zone. Note that HIIT and weights typically do not burn fat. SO WHY DO WE STILL NEED TO DO HIIT THEN? HIIT is great because it increases your general cardiovascular fitness and your anaerobic threshold. This means that during exercise your body will remain in the aerobic (fat burning) zone for longer, before switching to the anaerobic pathway. The result? You can exercise for longer and at a higher intensity and still burn fat. If you are sprinting for 15-30 seconds at your absolute fastest speed, with a 30-second rest, your body is using the anaerobic pathway and is using predominantly glycogen. Sprinting is a great workout. It engages your muscles more and focuses on muscular power. So you’re likely to build more muscles with sprinting than with just steady state running. If you don’t mind a more muscular look, then this is probably a great style of workout for you. But if you prefer a more lean and slim look, it might be best to avoid this type of training and focus on interval running instead. 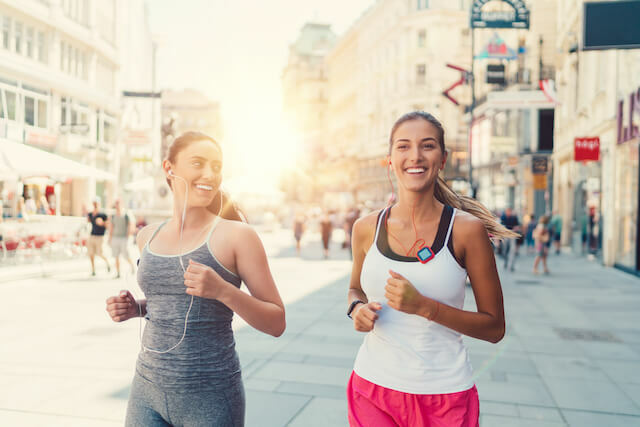 If you are running at a fast but not maximum speed for 90 seconds to 2 minutes, your body will most likely remain in the aerobic zone for the majority of the time. This means you’ll continue to burn fat. The fitter you are, the longer your body will remain in the aerobic (fat burning) zone before switching to anaerobic. The result? You’ll burn more fat! Interval running is my favourite type of HIIT. I started to use this technique a couple of years ago when I was training for a triathlon. I used fast pace interval runs (not a full on sprint) to help me develop my cardio fitness faster. And it definitely helped with my cardio fitness, as I expected. But I also noticed something else. You see, I’m a mesomorph body type and I can build muscle fairly quickly, especially on my legs. And interval running actually helped me lean out my legs. And since I prefer a more lean look, I love doing exercises that help me get toned and slim without making me bulky. SHOULD I TRY INTERVAL RUNNING? 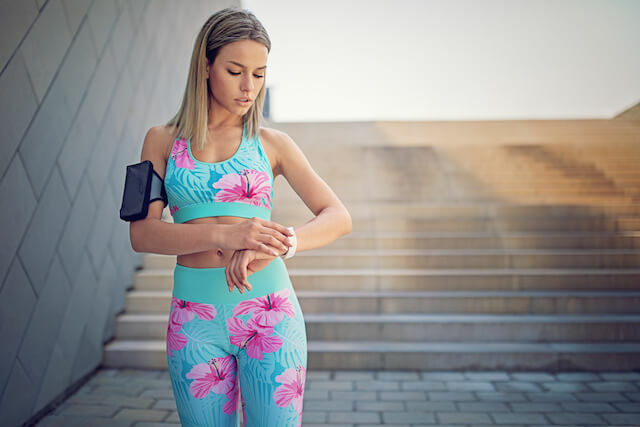 If your goal is to get slim and lean legs without the bulkiness and you want to achieve it a bit faster, interval running could work very well for you. This type of workout will help you burn a LOT of calories and is great if you want to challenge yourself. Interval running may not be the best choice for endomorphs. It may cause their legs to bulk up. If you are already in pretty good shape and you would like to do it, I would do this once per week at a maximum. I also need to warn that it is really difficult. If you are not already fit, I would not recommend it. But if you are sure you want to try interval running as your fat burning HIIT routine, don’t do a proper sprint. It’s supposed to be a more of a fast-paced interval run. This shouldn’t cause bulkiness like short and intense sprints usually do. Also make sure you do it on a flat surface. Hill runs are great but you will build more muscle that way. Repeat as many times as you can. If you’re a beginner, aim for 3-5 rounds. If you’re advanced, aim for 8-10 rounds. You can apply this same principle to other forms of gym equipment such as the bike or cross trainer/elliptical even though I have to say that those are not as great as interval running. But if you can’t run for some reasons, here are your alternatives. Cycling can cause bulkiness, especially if you are an endomorph body type. And even if you are a mesomorph I would still do it probably once per week. As for the cross trainer/elliptical, I don’t think that it will really cause bulkiness. This machine engages your quads so you can gain more leg muscle than you would like. But it’s not the style of workout that will necessarily cause your legs to really bulk up. If you can’t do interval running for some reason, the cross trainer is the next best thing. Exercise at a medium to high intensity for 90 seconds to 2 minutes. Have a rest or reduce the intensity for 60 seconds. I recommend a 60-second break, but if you need 90 seconds, that’s OK. This does not need to be done at the gym either. You could cycle outside rather than on the treadmill or bike. If you would like a more specific workout and nutrition program to target fat loss on your legs and to build lean muscle without getting bulky, check out my 3 Steps To Lean Legs Program. My program contains an 8-week workout and nutrition plan for each of the three body types. P.S. read this blog post for a body weight HIIT circuit that won’t bulk up your legs. The reason why I do hiit-workout is because I want to lower my body fat-pecentage and get those abs. If I do this instead of the hiit workout, will I still be able to get abs? If you’re an ectomorph or mesomorph body type, you should be able to do some interval running without getting bulky. This will work great for lowering your body fat percentage, but I would do other type of HIIT for abs, like the workouts in this blog post. Just wondering about Sprint Les Mills so Spin but 30min High intensity, I have been doing it 2x week. I was wondering how would be a good way to try and balance these work outs with high school life, because I am in high school but desperately want thinner, smaller and leaner legs. Also because my mother calls me fat. Even though everyone else says I am skinny. What can I do??? Does swimming help get lean legs?